Thanks to the Hawaiian-themed grocery store called Trader Joe's, vegetarian cowboys are now a thing. What vegetarianism and cowboys have to do with the overall tropical island theme of the store, I'm not quite certain. But we've seen at least one other vegetarian cowboy-themed product, not to mention candy fit for cowboys and cowgirls, too. I guess there's something earthy about cowboys—and there's something earthy about vegetarians and vegans as well. TJ's is just tying that all together for us. Or maybe they're aiming to challenge that stereotype of vegetarians being weaker than meat-eaters (I don't subscribe to that notion, by the way) by uniting it with the rugged machismo of the old western frontier. Regardless of all that, I'm fairly certain that more urban-dwelling hipsters will wind up eating this product than actual cattle-ropin' cowboys, if only because there aren't many TJ's in the middle of cattle country. Yet still, it's an amazing product. It's like a spicy black bean burger with chunky salsa cooked right into the "meat." It's not really one of those fake meat burgers that's desperately trying to taste like beef, so if it's a true burger you're craving, I say look elsewhere. But if you're adventurous and wanting something new, I'd encourage you to check this out. It takes the whole veggie burger thing one step further in terms of taste and texture. Not only is there quinoa mixed in with the black bean base, but there are chunks of peppers, corn, and whole black beans in the mix. It's a complex, hearty flavor with a slightly spicy southwestern vibe. I ate mine with a slice of asiago cheese and it blended perfectly. I mused about which condiments, if any, to throw on, and decided to eat it plain in the end. I'm a big fan of ketchup and mustard on almost anything that calls itself a burger, but in this case, I'd add a bit of extra hot salsa, if anything—but that's just my opinion. We cooked ours on the stovetop in a tiny pool of olive oil. It came out firmer and crispier on the outside than on the inside, and overall, the product was a bit soft. If not held together by a bun, it might have fallen apart very easily. 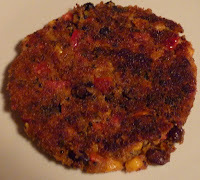 There's more substance in the peppers, corn, and beans than in the base of the burger itself—but still, I can't complain, since the aforementioned chunky ingredients were plentiful throughout. All in all, it's not a great approximation of an actual beef hamburger, particularly in the texture department, but a delicious vegetarian lunch or dinner nonetheless. At $3.69 for four patties, it's a good value also. I'm always on the lookout for something unique and new, and this burger didn't disappoint. All you rugged vegetarian cowboys, saddle up! My oldest turned me onto these.. Have u tried the Masala veggie ones? those are good as well...A customer was buying up the fresh soy burgers and said her son loved them... I tried those as well and yes, they are filling where u feel that u've definitely have eaten a' burger'. Yes I think we reviewed the Veggie Masala burgers on here. They're really good! Wow, these look awesome. My mom and brother would probably love these since they are obsessed with the Masala burgers. Yum! I could see it crumbled up and thrown into chili. This sounds interesting according to TJ's website: Ts & Js Sour Gummies and chicken pot pie ravioli. The sour gummies sounds good and it is interesting to try out a natural sour gummies. I wonder if it going be like sour punch kids. Both of those products sound interesting, Alek. Thanks for the heads up! I like to cut it in half, put it in a TJ's corn and wheat tortilla, and then top it with guac and sour cream/Greek yogurt. So good! Trader Joe's often uses similar art on similar products, and when they do something good, they repeat it. 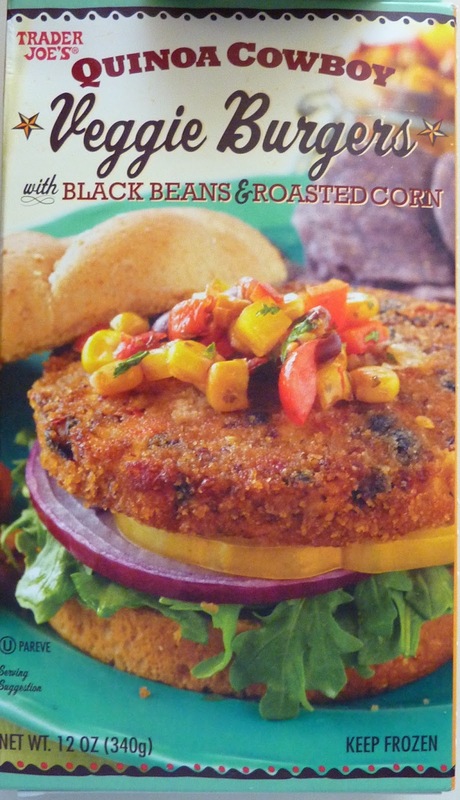 The cowboy caviar was brought out to complement the wildly popular tomato-less corn salsa. They didn't invent it, but the name was cute so they went with the cowboy theme. This also proved to be wildly popular, and thus cowboy culture at Tj's was born! There is a small part of me that wonders if the popularity of Pioneer Woman has contributed to the popularity of the cowboy theme? I think its worth stating that they come wrapped in single packages so you can bring them to work and throw them in the microwave. Yummmmmmy!!!! Put a fried egg on top!